Location is not available. <mapped drive> is unavailable. If the location is on this PC, make sure the device is connected or the disc is inserted, and then try again. If the location is on a network, make sure you’re connect to the network or Internet, and the try again. If the location still can’t be found, it might have been moved or deleted. I pulled my hair out for weeks trying to figure out what was causing it. I ruled out other causes such as the physical network, permission issues, and the antivirus software. Finally I discovered that I could reproduce the issue by opening one of the mapped network drives in Windows Explorer and then running “gpupdate /force” from a command prompt. So I knew it had to be a Group Policy that was causing it. 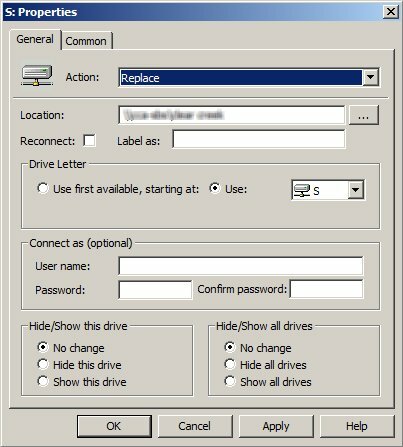 I discovered that the drives were being mapped using Group Policy Preferences and the Action was set to “Replace.” So every time the policy was applied, it would remove the drive mapping and recreate it, killing any open connections. The odd thing is that it didn’t seem to affect any of the Windows 7 clients but both the Windows 8.1 clients were experiencing this issue. I changed the Action to “Update” and the problem went away. This will disable background processing for drive mapping. Surface Pro 3, Windows 8.1, In a Domain. This setting is in the Group Policy Editor on the server which assigns the drive mappings.